The 2011 Halloween edition of Tait Avenue (and the surrounding streets) is expected to be every bit as good as previous years for costumed critters, kids and kids-at-heart. Los Gatos is a town that takes its outdoor entertainment very seriously. Attendance figures burst at the seams when it comes to annual events such as Jazz in the Plaz, Music in the Park and Fantasy of Lights. While it’s a night for tricks and treats, the residents of Tait Avenue are all business whenever October 31st creeps closer on the calendar. The 2011 Halloween edition of Tait Avenue (and the surrounding streets) is expected to be every bit as good as previous years for costumed critters, kids and kids-at-heart. When driving down the street in the middle of the day during the week preceding Halloween, one notices that only a handful of homes are decked out with their best and scariest decorations. 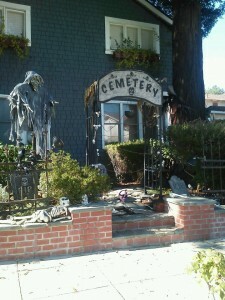 It’s probably due to the fact that the neighbors are not wanting to tip their hands when it comes to revealing the decor and themes of their exteriors, at least not until the weekend just prior to Halloween. Whether this secretive ploy is merely to reveal their creations only to the trick-or-treaters on All Hallows Even or not give fellow neighbors the opportunity to outdo their own decorations, it really doesn’t matter. Those who come to Tait Avenue on October 31st and the community at large all seem to benefit from such spooky civic pride. On the actual night, Tait Avenue is closed off and is completely open to foot traffic. And revelers of all ages are there in droves, adorned in their Lady Gaga, Jack Sparrow or vampire getups. Despite the large crowds, it’s a safe venue for the kids. The number of out-of-towners who come to Tait Avenue is testament to the street’s safety and friendly confines. It is not unusual to see the homes’ inhabitants sitting on their long porches passing out candy, while sipping a wine that is produced in the Santa Cruz Mountains just behind them. After all, not all the treats have to be given away to the kids, and what better way to celebrate such a fun evening than enjoying a bottle of vino. The Tait folks get this concept. The decorated homes range from ultra-creepy, replete with graveyards, thick fog, eerie lighting and an accompanying ghostly soundtrack, to cute and cuddly that should put the little ones (or the feint of heart) at considerable ease. For those driving into the area, it is wise to get there prior to nightfall. Parking’s at a premium and the streets are sure to be swollen as soon as the sun sets.